Alice Somerville’s inheritance lies six feet under in a Highland peat bog – a pair of valuable vintage motorbikes buried by her grandfather at the end of World War II. But when Alice finally organises their recovery, she finds an unwelcome surprise -a body with a pair of bullet holes . . . and Nike trainers. DCI Karen Pirie of Police Scotland’s Historic Cases Unit is called in to unravel a case where nothing is quite as it seems. 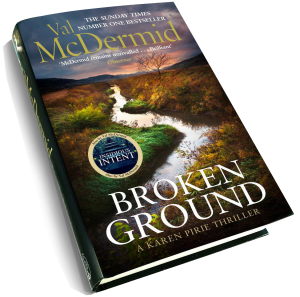 Val’s latest novel “Broken Ground” is out now in the UK.